An imposing detached period family home that has been the subject of total refurbishment throughout. On the ground floor of this extended property can be found a stunning full width kitchen/dining/family room with two sets of double opening doors leading to the rear garden, underfloor heating with engineered light oak flooring throughout and vaulted ceilings. The kitchen with central island provides a modern hub to this space. 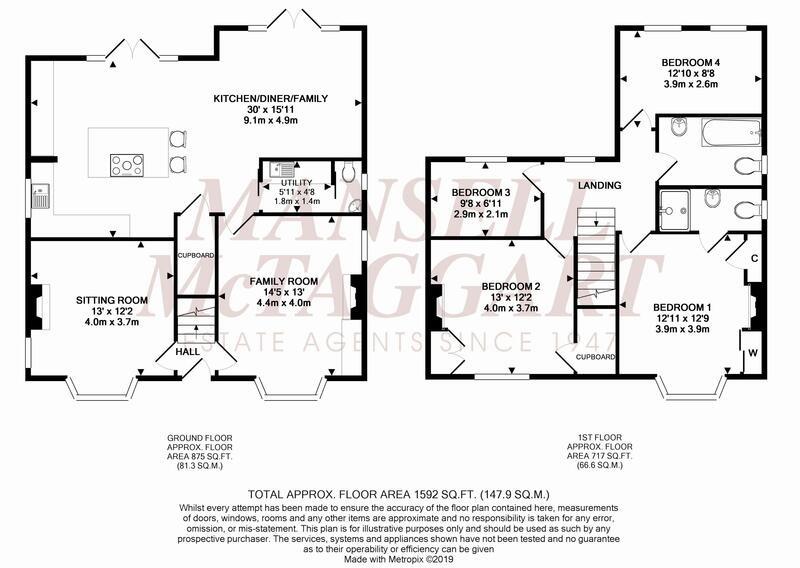 Also on this floor can be found two further large bay fronted reception rooms, a cloakroom and a utility room. On the first floor, the master bedroom boasts a large modern en-suite shower room and the family bathroom also offers a touch of contemporary luxury, both finished to a very high standard. There are three further bedrooms located on this floor. Outside there is a large gravel driveway providing plenty of parking, front and rear gardens and a self contained garden room. Double glazing throughout and GCH. Located close to the mainline railway station, local shops and amenities, as well as near to the very highly regarded Weald secondary school. The property is situated in a highly convenient location within walking distance of Billingshurst train station and The Weald School. The High Street is also within a short walk offering a range of amenities including local shops, restaurants and cafe as well as a church and good bus service. The mainline station provides fast and frequent services to Victoria/London Bridge (approximately 65 minutes), Gatwick International Airport and the south coast. There are schools for all age groups within the locality, both state and independent, including the Weald Community School/6th Form and Billingshurst Primary School. There are private schools in the area including Pennthorpe at Rudgwick and Farlington, an independent day and boarding school for girls located on the outskirts of Broadbridge Heath. The larger towns of Horsham, Guildford and Chichester are all within easy driving distance and there are excellent road links via the A272, A264, A29 and A24 to the M23 and major motorway network. Golf can be found nearby at Slinfold and sporting/leisure facilities can be found at the leisure centre in Billingshurst. For the walking and riding enthusiast there are miles of beautiful surrounding open countryside including the newly-formed South Downs National Park lying to the west at Wisborough Green.